Pacific Autism Family Centre Foundation’s Board Members Grayden Hayward and Jack McGee display a $100,000 cheque from Pacific Blue Cross’ President and CEO, Jan Grude, Chair of Pacific Blue Cross Community Connection Health Foundation, Richard Taylor, and Simone Hung, Customer Service Representative, and her two sons. 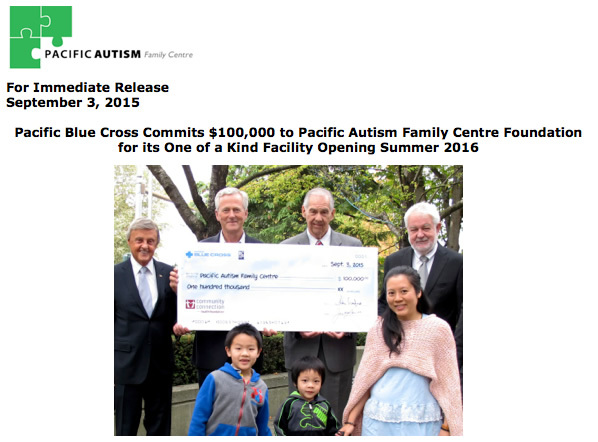 VANCOUVER, BC– The Pacific Autism Family Centre Foundation (PAFCF) today announced a $100,000 donation from Pacific Blue Cross Community Connection Health Foundation toward its new “Hub and Spoke” Modeled Centre in Richmond, BC. The funds will be used to create the ‘Pacific Blue Cross Pre School Room’. “We are thrilled with this commitment” say PAFCF Board Members Grayden Hayward and Jack McGee. “Pacific Blue Cross’ mission to improve health and well-being in British Columbia has certainly been demonstrated through this gift to the Foundation. We are creating a one-stop shop for individuals with Autism Spectrum Disorder, and this is only made possible through the support of our government, community and corporate partners such as Pacific Blue Cross. On behalf of our Board, we offer our sincerest gratitude”. The donation is especially meaningful for Pacific Blue Cross employee Simone Hung and her two sons living with Autism Spectrum Disorder. “I’m glad this donation will bring awareness to Autism Spectrum Disorder and create a place for families to connect and receive support from dedicated practitioners,” says Simone. 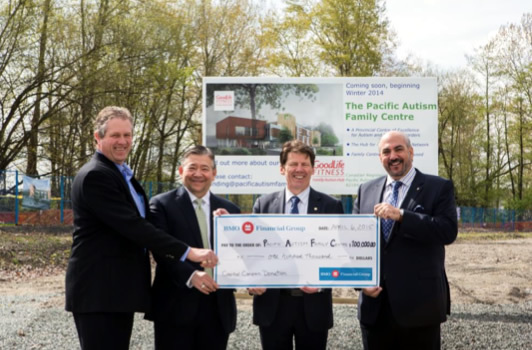 “We welcome the opportunity to support the Pacific Autism Family Centre Foundation in their endeavors to meet the health care needs of British Columbians” said Richard Taylor, Chair of Pacific Blue Cross Community Connection Health Foundation. Pacific Blue Cross has been British Columbia’s leading health insurance and benefits provider for 75 years. Our comprehensive understanding of health care needs fuels our commitment to service. Together with our subsidiary, British Columbia Life & Casualty Company, we provide health, dental, life, disability and travel coverage for approximately 1.5 million British Columbians through employee group plans and through individual plans for those without group coverage. Pacific Blue Cross and BC Life & Casualty continue to meet customers’ needs for innovation in plan design, administration and technology. Pacific Autism Family Foundation’s Founder Wendy Lisogar-Cocchia displays a $75,000 presentation cheque from TD Bank Group’s Stephen Vermette. 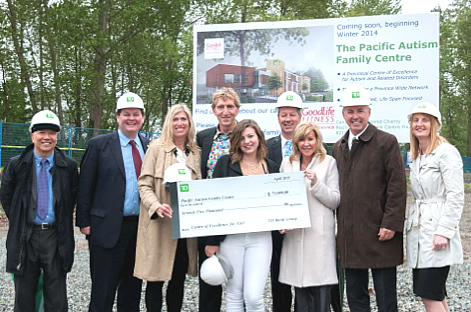 RICHMOND, BC – The Pacific Autism Family Foundation today announced that TD Bank Group made a $75,000 donation to its capital campaign for its new “Hub and Spoke” Modeled Centre that will be located in Richmond. “I am so excited to accept this donation from TD Bank Group” says Pacific Autism Family Foundation Founder Wendy Lisogar-Cocchia. 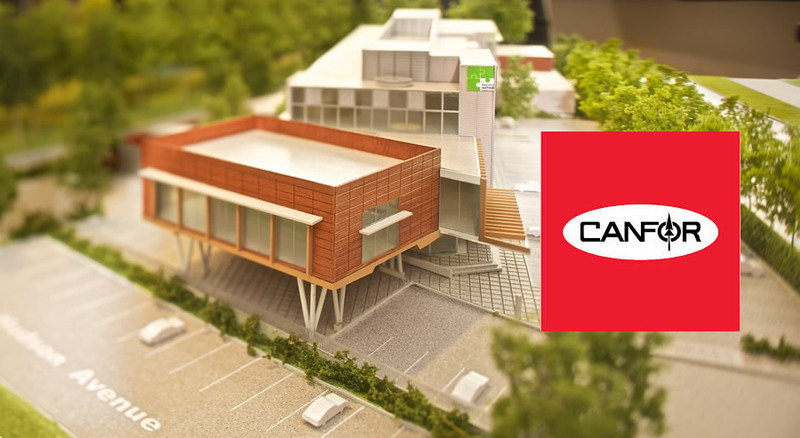 “This is an especially meaningful day because we have just been told that construction on the GoodLife Fitness Autism Family Hub is slated to begin next week, with a June 2016 completion date. After six years of planning, families on the autism spectrum and related disorders can finally see their hope become reality. This would never have been possible without our government, community and corporate partners such as GoodLife Fitness, and now TD Bank Group. Sergio and I and the entire autism community offer our heartfelt thanks”. Pacific Autism Family Foundation’s Board Chair and Co-Founder Sergio Cocchia displays a $100,000 presentation cheque from BMO Financial Group’s Henry Donkers, Steve Saccomano Derral Moriyama. “BMO Financial Group strongly believes in making joint commitments with organizations to create successful community opportunities for individuals with autism. The $100,000 is a commitment toward the forward thinking Centre – the first of its kind in Canada to bring together state of the art research, information, learning, assessment, treatment and support for individuals with Autism Spectrum Disorders and related disorders” says Henry Donkers, Regional Vice President, Vancouver Westside and Richmond Market, BMO Bank of Montreal.